Complimenting the courtyard space on the 2nd floor, CRJA-IBI Group collaborated with Knoxville based architects on the design of a 4,500 SF roof garden for the East Tennessee Children’s Hospital. 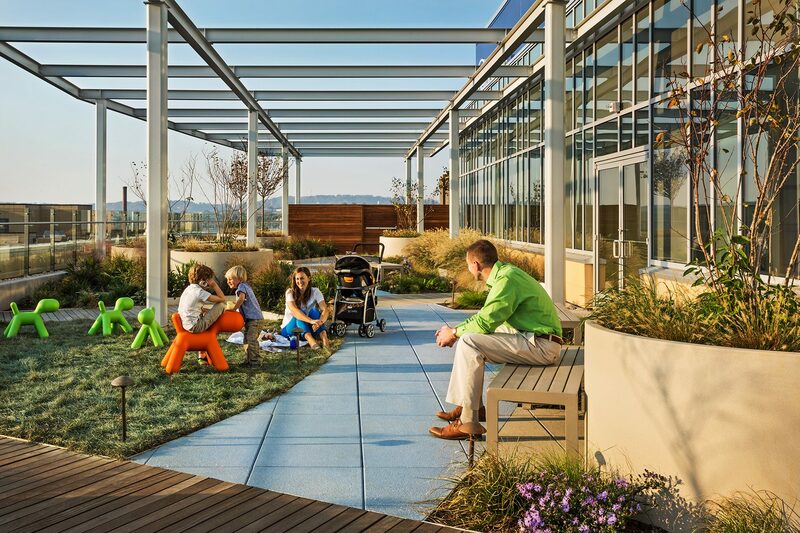 Located on the fifth floor roof, adjacent to the neo-natal intensive care unit, the garden was designed to provide a tranquil place for families and staff to get away from the stressful hospital environment. The garden design employs a curvilinear motif, inspired by the Tennessee River and the native riverfront landscape. This motif is expressed with colored paving representing the river, wood decking that suggests bridge crossings and meadow plantings of perennials and grasses that move with the wind. There is also a large lawn panel where visitors may feel invited to take their shoes off, lie down and look at the clouds. Prior to developing the design, CRJA-IBI Group met with representatives of the hospital to understand the programming needs, budget and maintenance requirements. The design incorporates a variety of seating areas, accommodating the need for privacy, close proximity to the ward and space for outdoor dining. Shade is provided by small ornamental trees and a shade structure, designed by the architects, which incorporates fabric panels that are strategically placed above seating areas. A storage room for garden equipment is provided inside the building, adjacent to the staff area.